JAMMU, July 14: National Lok Adalats were held across the State including both wings of the High Court today under the patronage of Justice Alok Aradhe, Acting Chief Justice, High Court of J&K (Patron-in-Chief, J&K State Legal Services Authority) and guidance of Justice Ali Mohammad Magrey, Member, National Legal Services Authority and Chairman, High Court Legal Services Committee. 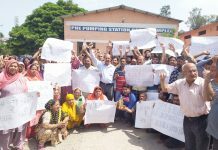 “A total number of 14,080 cases were disposed off and an amount of Rs.39, 86, 98,410.00 approximately was awarded as compensation in different type of cases”, said Yash Paul Bourney (District & Sessions Judge and Member Secretary, J&K SLSA). Justice Ali Mohammad Magrey in presence of Justice M K Hanjura inaugurated Lok Adalat Sessions in ADR Centre, High Court Complex, Srinagar. 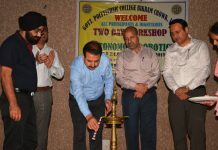 They also inaugurated Lok Adalat organized by District Legal Services Authority Srinagar under the chairmanship of Principal District & Sessions Judge Srinagar, Mohammad Akram Chowdhary at District Court Complex, Moominabad. Two Benches at High Court and six Benches at lower court had been constituted for holding these Lok Adalats. Out of total number of 311 cases that were taken up before the Lok Adalat at High Court, 34 cases were settled amicably. Bench No 1 was presided by Principal District Judge Srinagar, Mohammad Akram Chowdhary and assisted by Presiding Officer Motor Accident, Subash Chander Gupta. 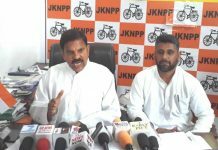 Both had taken up 34 cases out of which 21 cases were amicably settled with an amount of Rs 1,13,10,000 was granted as compensation on this occasion. In Bench No 2, Presiding Officer District Consumer Protection Forum Srinagar, Mohammad Ashraf Malik was assisted by Advocate Member, Farah Deeba. The bench took up 32 cases out of which 9 cases were settled and a compensation of Rs 4,63,925 was granted. Bench No 3 dealing with Bank Recovery cases was presided over by Additional District Judge Bank Cases Srinagar, Kalpana Revo and assisted by 3rd Additional District Judge, Srinagar Mehmood Ahmad Chowdhary, took up 120 cases with compromise pre-litigation cases out of which 16 cases were amicably settled. Bench No 4 was presided over by Additional District & Sessions Judge, Srinagar, Parvaiz Hussain Kachroo who was assisted by 2nd Additional Munsiff Srinagar, Faizanul-Haq Iqbal took up 30 cases out of which 12 were settled. The Bench No 5 presided over by Forest Magistrate Srinagar, Mohammad Rafiq Chak and assisted by Municipal Magistrate Srinagar, Yashpal Sharma took up 50 matrimonial and criminal compoundable cases out of which 27 were amicably settled. Bench No 6 was presided over by Additional Mobile Magistrate (Traffic), Srinagar, Mir Wajahat who was assisted by 3rd Additional Munsif, Srinagar, Nusrat Ali Hakak. They had taken up 1100 cases of offences and violations under Motor Vehicles Act, out of which 993 were amicably settled and a fine of amount Rs 2,02,350 was recovered. In Budgam, National Lok Adalat was organized in District Court Complex under the chairmanship of Principal District and Sessions Judge Budgam Rajeev Gupta. During the Adalat, cases of varied natures were taken up for hearing and among them, many were settled. In Kulgam, Lok Adalat was held in the premises of District Court Complex Kulgam in which 258 cases of different natures were taken up for hearing, out of which 179 cases were settled amicably. An amount of Rs 444550 was realized in different cases of electricity bills and water bills, and Rs 38975 was imposed as fine in criminal RPC challan and traffic challans. 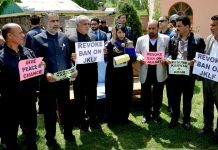 In Anantnag, District Legal Services Authority constituted eight benches under the supervision of District and Sessions Judge Anantnag Syed Tawqeer Ahmad. As many as 442 cases related to recovery suit, MACT, electricity cases, traffic challans, civil and matrimonial cases were taken and 395 cases were settled amicably. In Shopian, National Lok Adalat was held in the premises of District Court Complex under the supervision of chairman District Legal Service Authority Shopian, Ashok Kumar Shavan. During the proceedings, 288 cases of different natures including pre-litigation were taken up, of which 258 cases were settled by mediation and reconciliation. At Kupwara, National Lok Adalat was held in the district for which eight benches were constituted. During the Adalat, 1125 cases were taken up of which 250 cases were disposed-off. A sum of Rs 41 lakh was recovered as bank dues and Rs 51.45 lakh in other civil matters. 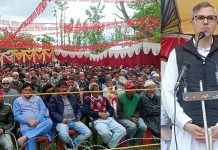 In Baramulla, National Lok Adalat was organized under the chairmanship of Sub Judge, Baramulla Khursheed-ul-Islam. As many as 1878 cases were taken up during the Lok Adalat, of which 1573 cases were settled amicably. A Lok Adalat was held in the District Court Complex, Janipur Jammu under the chairmanship of Vinod Chatterji Koul, Chairman, District Legal Services Authority (Principal District & Sessions Judge) Jammu. A total number of ten benches were constituted at District Court Complex, Jammu. The first bench was presided over by VC Koul. He was assisted by Haq Nawaz Zargar, 3rd Additional District & Sessions Judge, TADA/POTA Jammu and Tasleem Arief, Additional Sessions Judge, Anticorruption, Jammu. 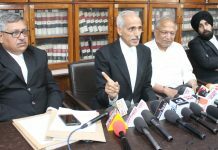 The second Bench was presided over by ML Manhas, Special Judge Anti-corruption, CBI Cases Jammu, assisted by Ranbir Singh Jasrotia, Additional District Judge, Matrimonial cases, Jammu and Sonia Gupta Special Judge Anti-Corruption, Jammu. The third Bench was headed by Bala Jyoti, Additional District Judge, Bank Cases Jammu, and assisted by Surinder Singh, City Judge Jammu. The fourth Bench was headed by MS Parihar, 1″ Additional District & Sessions Judge Jammu, assisted by Jatinder Singh Jamwal, presiding Officer MACT Jammu. The fifth Bench was headed by Ashwani Kumar Sharma, Chief Judicial Magistrate, and assisted by Madan Lal, Special Excise Magistrate, Jammu. 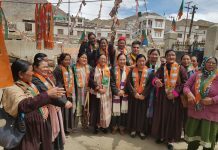 The Sixth bench was headed by Kusum Lata Pandita, Sub Judge Jammu, and assisted Wangial Tsering, Forest Magistrate Jammu. The seventh Bench was headed by Sudhir Khajuria, Special Electricity Mobile Magistrate, Jammu and assisted by Manjeet Rai, Special Mobile Magistrate P&T, Jammu. The eighth Bench was headed by Som Lal, Sub Judge Special Mobile Magistrate Jammu (13FC), and assisted by Arti Devi, Munsiff JMIC Jammu. The ninth Bench comprised of Yahya Firdous Ahangar Special Railway Magistrate, Amit Sharma, Special Mobile Magistrate Traffic, Jammu and Slahuddin Ahmed, Additional Mobile Magistrate, Traffic Jammu. 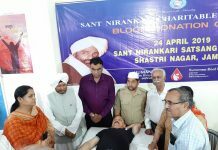 The tenth Bench comprised of Manoj Parihar, Special Municipal Magistrate Jammu, Swati Gupta, Sub-Registrar, Jammu and Additional Deputy Commissioner Jammu. Cases of civil nature, criminal compoundable, petty offences, bank recovery cases, MACT cases, consumer cases, matrimonial cases, cases under 138 NIA, revenue, electricity, water, passenger tax and railway cases were taken up and settled in the Lok Adalat. A total number of 7195 cases were taken up, out of which 6492 cases were disposed off/ settled. A total of Rs 26,40,06,480 was settled in the Lok Adalat. Lok Adalat Benches were also constituted at Tehsil Headquarters at Akhnoor, Bishnah and RS Pura which were presided over by respective Chairman, Tehsil Legal Services Committees. At Udhampur, National Lok Adalat was held under the chairmanship of KS Parihar (Principal District & Sessions Judge Udhampur) regarding different kind of cases under the direction of acting Chief Justice Alok Aradhe, High Court of J&K (Patron-in-Chief J&K State Legal Services Authority). A total number of five benches were constituted in which 704 cases pertaining to different nature were taken up, out of which 525 cases were settled. An amount of Rs 55, 85,000 in MACT cases and Rs 5,79,755 was realized in Bank cases and Rs 1,70,600 was imposed in criminal compoundable cases as a fine. District Legal Services Authority Reasi under the chairmanship of SR Gandhi (Principal District and Sessions Judge), Chairman District Legal Services Authority Reasi also organized Lok Adalat. In all 574 cases of different nature were taken up and 255 cases were settled. Three benches for settling the referred cases were constituted. They were comprised of SR Gandhi (District Judge Reasi), Rimpi Rani (Munsiff Reasi), VS Manhas (Sub Judge, CJM Reasi), Sandeep Gandotra (Sub-Judge Katra) and Parveen Pandoh (Munsiff Katra). Lok Adalat was also held in District Court, Poonch, under the chairmanship of DLSA Poonch, Zabair Ahmed Raza (Principal District & Sessions Judge Poonch). Two benches were constituted for the Lok Adalat which were comprised of Zabair Ahmad Raza, Mohd Ashraf Khan (JM Poonch) and Wajahat Kazmi (district Mobile magistrate (T) Poonch. The Surankote bench was presided over by Muzaffar Iqbal Khan (Sub-Judge) and he was assisted by Sarfraz Nawaz Qureshi (Additional Mobile Magistrate Surankote) while the Mendhar bench was presided over by Choudhary Riaz Ahmad (Munsiff JMIC). A total number of 745 cases were taken up in today’s Lok Adalat out of which 640 cases were settled. A total of 48 civil and 81 criminal cases were also decided. In civil cases, an amount of Rs 744250 was settled. In MACT cases, Rs 3490000 was awarded whereas in pre-litigation cases, Rs 744250 was recovered. In criminal cases, Rs 45150 as fine was recovered. In National Lok Adalat held under the chairmanship of Sumati Sharma in Munsiff Court Complex Chenani, 20 cases were taken up out of which 4 cases were decided amicably and a fine of Rs 3000 was imposed. Besides this, 14 number of traffic challans were disposed of and a total fine of Rs 5600 was realized on the spot from defaulters. In the Lok Adalat held at District Court Complex, Rajouri, under the chairmanship of Rajinder Sapru (Additional District & Session Judge Rajouri) four benches were constituted. They were comprised of Rajinder Sapru, Riyaz Ahmed Mirza (CJM Rajouri), Tabraiz Ahmed Qazi (District Judicial Mobile Magistrate Rajouri) and Tehsildar Rajouri. A total number of 550 cases were taken up by these benches out of which 512 cases were disposed off. An amount of Rs 63,15,640 was settled. A total number of 20 MACT cases were also taken up and 15 of them were settled while an amount of Rs 62,33,000 was awarded as compensation. In Kathua district, Lok Adalat was held under the chairmanship of Chairman, District Legal Services Authority Kathua, Sanjeev Gupta. Three benches were constituted. Bench No 1 was comprised of Principal District & Sessions Judge Kathua, Sanjeev Gupta and Additional District & Sessions Judge Kathua, Sikander Azam Choudhary. 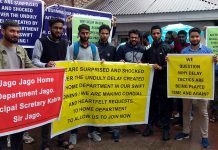 Bench No 2 was comprised of Special Mobile Magistrate Kathua, Sunil Sangra and District Mobile Magistrate Kathua, Munish Kumar Manhas where as Bench No 3 was comprised of Munsif JMIC Kathua, Preet Simran Kour and Retainer lawyer DLSA Kathua, Nidhi Suman. Cases pertaining to Criminal Compoundable cases, MACT cases, Bank cases, Labour cases, Revenue and civil cases were taken up in the Lok Adalat. Compensation worth Rs 20,50,000 was awarded in the MACT cases, and a recovery of Rs 42,72,344 was also passed in favour of the Banks. In Doda district, Lok Adalat was organized by the District Legal Services Authority, Bhaderwah (Doda) under the chairmanship of MK Sharma, Chairman DLSA (Principal District & Sessions Judge), Bhaderwah. A total of 312 cases were taken up, out of which 90 were disposed and an amount of Rs 62,71,385 was settled in the MACT cases, Bank recovery and other criminal compoundable cases.